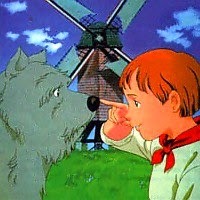 Dog of Flanders, a tearjerker Tagalog-dubbed anime series that was broadcast by ABS-CBN during the 1990s, will start its re-run on the same television network starting today at 9:30 in the morning from Monday to Friday. The original series is the 1992 Tokyo Movie Shinsha (TMS) production My Patrasche. Two years later, ABS-CBN started airing the Tagalog-dubbed version as part of a children's programming block that also included Bananas in Pyjamas and A.T.B.P. (Awit, Titik at Bilang na Pambata). Dog of Flanders has literary roots: It is an adaptation of A Dog of Flanders, a novel by Maria Louise Rame. Set in 19th-century Belgium, the novel is about an orphan boy named Nello, his grandfather Jehann and the titular canine Patrasche. In the early part of the story, Patrasche was a beaten dog who was found and taken care of by Nello and Jehann. Following recovery to health, Patrasche helped Nello and Jehann in selling milk by pulling their cart into town. Moreover, the dog became Nello's best friend. Dog of Flanders was my favorite childhood cartoon and I am so happy to see it again on TV.Now my daughter will also enjoy her mamma's childhood cartoon.